With temps soaring into the 60s this morning, there was no force great enough to keep me indoors working. I loaded my dog Matika into the car and drove to Niquette Bay State Park to do my first hike of the warm season. 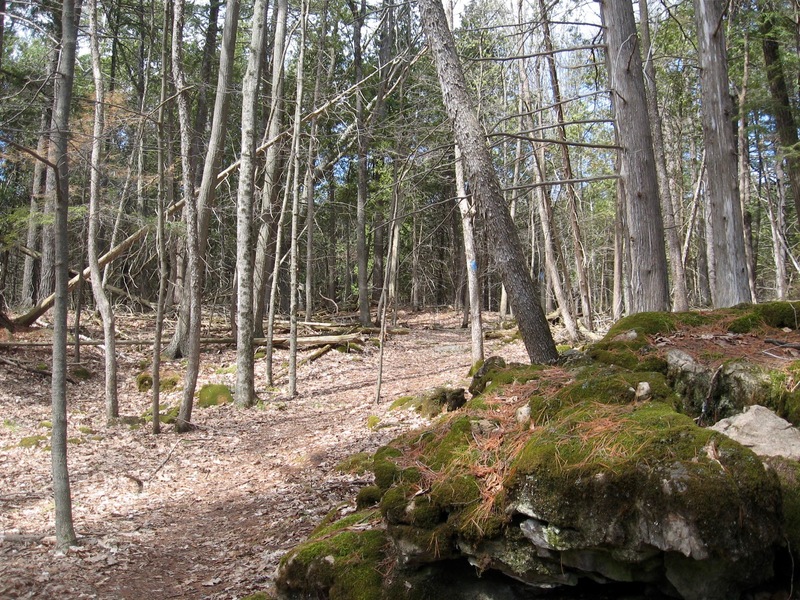 The trail was surprisingly dry despite the recent snow melt-off and three days of rain. No matter. I made it a point to leave a set of boot prints pressed deep into the few mud holes that I came upon. Matika did the same. I passed a couple other hikers with their restless dogs, otherwise I had the woods all to myself. A woodpecker serenaded me with his loud knocking. I listened to the telltale songs of nuthatches, chickadees, and robins as I tramped. Otherwise all was quiet. The sun played hide-and-seek from the clouds overhead. A cool breeze blew inland from the punky ice still covering the edges and bays of Lake Champlain. Trees creaked as the wind whispered through their upper boughs. I caught a whiff of that intoxicating forest smell and instantly came down with a case of spring fever. I cut my pace to a crawl just to savor the walk. Matika took notice but didn’t seem to mind. All the same, I broke a sweat as the trail turned sharply then started climbing. My leg muscles complained, grossly under-used through the winter. Yeah, I felt all of my 61 years as I climbed the hill, but didn’t mind it one bit. There’s a time for thinking deep thoughts, and another for simply being in the moment. During this outing, all I wanted was to move through the forest, sweating, while grooving on the sights, sounds, and smell of it – more in my body than in my head, like my dog. It has been a long winter. It felt good to be back on the trail again. Three days, three short hikes. There’s business to be done but it’s hard staying indoors. We’re into sunny weather now with temps reaching into the 50s, 60s. I’m taking time to stretch my legs and groove on nature’s awakening. I hike strong and hard down the trail… because I can. The flu bug that felled me last month is long gone. I’m getting my strength back. Feels good to speed hike like a man on a mission. My dog Matika has a hard time keeping up. She’s a little annoyed, actually. I’m cutting into her sniffing time. The forest is leafless and brown for the most part. That’s okay. The greenery will come soon enough. It has already begun, actually. 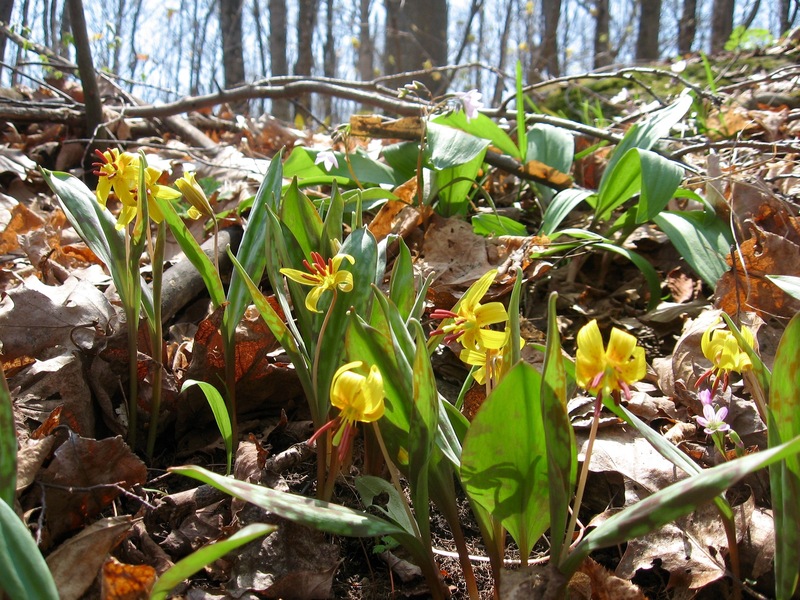 Patches of trout lily leaves and other vegetation have arisen from the forest duff already. Yeah, the great green explosion is not far away. What’s this? Round-lobed hepatica in full bloom! Dozens of creamy white and blue flowers quake in the gentle breeze. Some are still unfurling. They haven’t been up more than a couple days. Always one of the first wildflowers to grace the forest floor, they mesmerize me. I drop down on the ground for a closer look. Continuing along the trail, I am giddy with the prospects of the growing season ahead. Then I start plotting: When can I get into the woods for an extended hike? Breaking a sweat, I strip off my light jacket and breathe in deeply the cool air. Like me, Matika is all smiles. And why shouldn’t she be? It’s a glorious spring day and we’re in the thick of it. 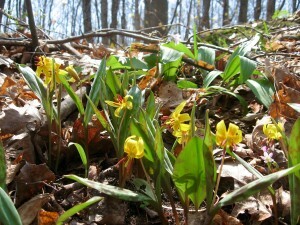 Temps skyrocket into the 70s, trees start to leaf out, and the forest floor is covered with wildflowers all of a sudden. It seems too good to be true. Then I remember that we’re in May now, thus convincing myself that this is the regular sequence of events. Nature is right on schedule. A part of me remains skeptical, as if all this is just an illusion masking a colder, darker reality. There now, right before me is a patch of trout lilies in full bloom. 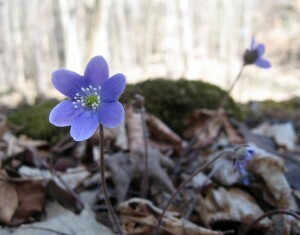 Beyond them round-lobed hepatica, Dutchman’s breeches, and trilliums. A few minutes ago, I admired the pure white flower of bloodroot, the half-hidden purplish flower of wild ginger, and blue cohosh. A few minutes later, I am snorting the sweet perfume of spring beauty. Then I roll onto my back and stare at the azure sky, blown away by the season. How many long winter days did I dream of this? It doesn’t matter. I’m here now. The spring bloom always comes as something of a surprise no matter how much I’ve been anticipating it. I roam around the woods in quiet disbelief. A couple days ago, I went barefoot outdoors for the first time this year. Yesterday I broke a sweat walking about town in a single layer of clothes. Today a warm breeze caresses my brow, rendering me silly with simple elemental joy. Were there really snow flurries blowing around a week ago? It doesn’t matter. I’m here now. With temps shooting into the 70s, I dropped everything yesterday morning and went for a hike. Niquette Bay seemed the place to go: low elevation and close to home. Still too much snow in the mountains. The first thing that struck me when I stepped out of the car was the smell of trees, forest duff and raw earth. That’s something I’ve missed terribly. Ah, to have a soft muddy trail underfoot again! Remnant patches of snow lay hidden in shadowy places. A blazing sun illuminated the forest. And the air was full of birdsongs – robins, chickadees, and some other bird whose name I’ve forgotten over the long, hard winter. Not far into my hike, I heard peepers in the distance. I left the trail in search of them – woods wandering once again. I stumbled into a vernal pool where a solitary wood frog floated. He clucked away incessantly as I kept a respectful distance. 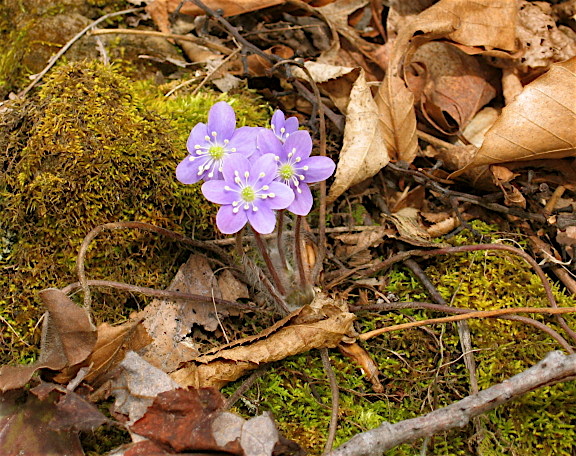 Then returning to the trail, I spotted something that took my breath away: round-lobed hepatica in full bloom. Considering how the snow and ice have lingered well past the Vernal Equinox, how is that possible? A fierce wind blew cold across Lake Champlain. Down by water’s edge, I listened to fragmented ice tinkle as it jammed against the shoreline. 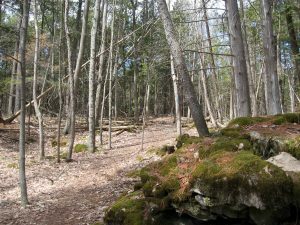 Back on the trail, I crossed burbling rivulets of spring run-off making their way towards the lake. The elements on the move again. Near the crest of a hill, while tramping dreamily along the trail with my dog Matika, a mourning cloak butterfly fluttered past. From a ledge I saw snow still clinging to cold, blue mountains in the distance, making me wonder. Then a woodpecker telegraphed a message across the forest, removing all doubt as to what time of year it is. In shirtsleeves yet sweating, I burned off the last of an indoor funk. Hope springs eternal in wild nature, when the world suddenly awakens. A tidal wave of green sweeps through the Champlain Valley during a succession of warm, dry days, giving me a serious case of spring fever. There’s no sense fighting it. I load my backpack, usher my dog into the car and head for the hills. Next thing I know, I’m hiking up a logging road winding deep into the mountains. 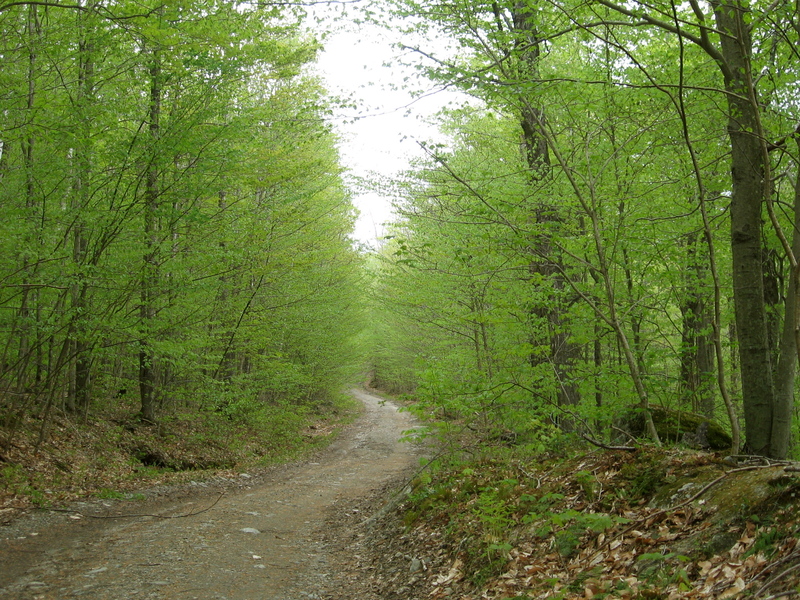 The road narrows to a trail shortly after crossing a brook. I leave the trail, following the brook upstream until I reach the edge of spring. There I find painted trilliums just opening up. There I set up my tarp on a high piece of ground, just in case the clouds gathering overhead deliver the rain that has been forecasted. The stream rushes along incessantly. A few black flies swirl around my head without biting. I collect enough dry wood to keep a small fire going after dinner. Matika chews a stick, then another. 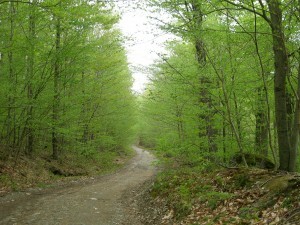 The intoxicating smell of pollen, warm earth and forest rot fills the air. A slight breeze spits a few raindrops my way. I don’t care. I feed sticks into the campfire for hours on end. A hermit thrush sings in the distance. Darkness descends. Then an eerie calm overtakes the forest. A light rain falls shortly after Matika and I slip beneath the tarp for the night. It doesn’t last. I toss and turn a while before falling into a deep sleep. I awaken to a Virginia waterthrush singing loudly at daybreak. Matika licks me until I rise. I stumble down to the brook to splash cold water into my face. The sun clears the ridge, peeking through the trees as I lounge before a breakfast campfire. When all the sticks in my woodpile are gone, I break camp. An hour hike out takes two hours. I admire a patch of bleeding hearts along the way and stop by the brook crossing to daydream. Matika sniffs around. A forest calm lingers within long after I return to the car. The green overtaking the valley seems richer than it was the day before. I revel in it. Backcountry traveler, freelance writer, and philosopher of wildness, McLaughlin has ventured into the wilds of Southeast Alaska and New York’s Adirondacks as well as the forests of northern New England. More about Walt. 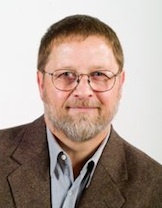 Woods Wanderer is published by Walt McLaughlin. Content on this site is provided via a Creative Commons License.